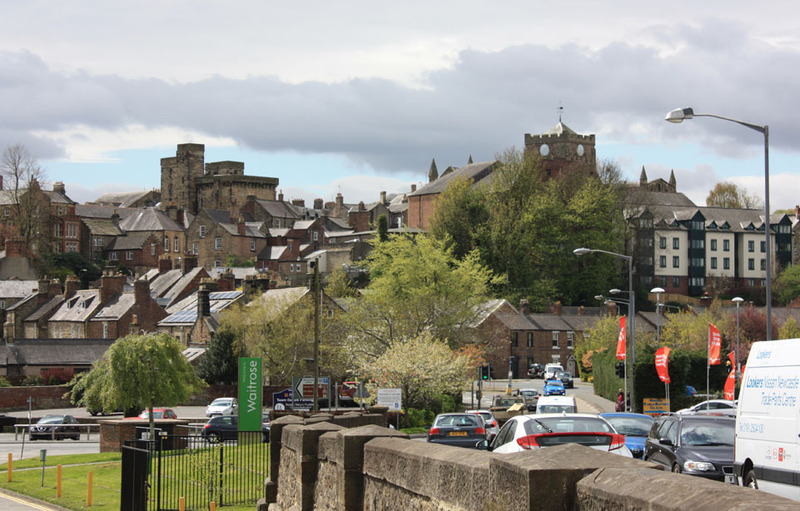 Despite the important status of Hexham as the largest town and capital of Tynedale and its role as the main centre for touring Hadrian’s Wall, Hexham surprisingly does not seem to have Roman origins. One suggestion is that the town was once the site of a number of Roman villas belonging to prominent Roman officers but this has never been proved. 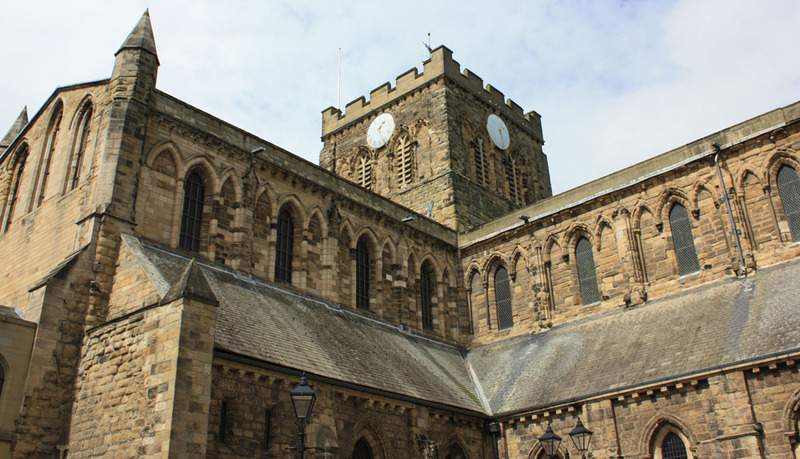 Hexham’s recorded history does not begin until 674 A.D, three centuries after the Roman departure, when in Anglo-Saxon times, an abbey was founded here by the Northumbrian saint and bishop, called Wilfrid. Educated on the holy Northumbrian Island of Lindisfarne, St Wilfrid (634 – 709 A.D) had travelled to Rome and was impressed by the lifestyle and magnificence of European churches. He decided that something of a similar nature needed to be built in Northumbria. The results were the great churches at Hexham and Ripon. Hexham Abbey was one of the first buildings in Anglo-Saxon Britain to make full use of stone. Wilfrid’s abbey at Hexham was regarded as one of the finest in the country and its beauty was particularly enhanced by the use of Roman stones taken from the ruins of Hadrian’s Wall and the nearby Roman fort at Corbridge. Wilfrid was a flamboyant, highly educated and persuasive man but his talents brought him into inevitable conflict with the King of Northumbria, who threw him into prison for nine months. On release, Wilfrid was banished from Northumbria and fled to Sussex, where he played a very important part in converting the South Saxons to Christianity. For a time Wilfrid’s abbey at Hexham had the status of a cathedral and was the centre of a see stretching from the Tees to the River Aln. 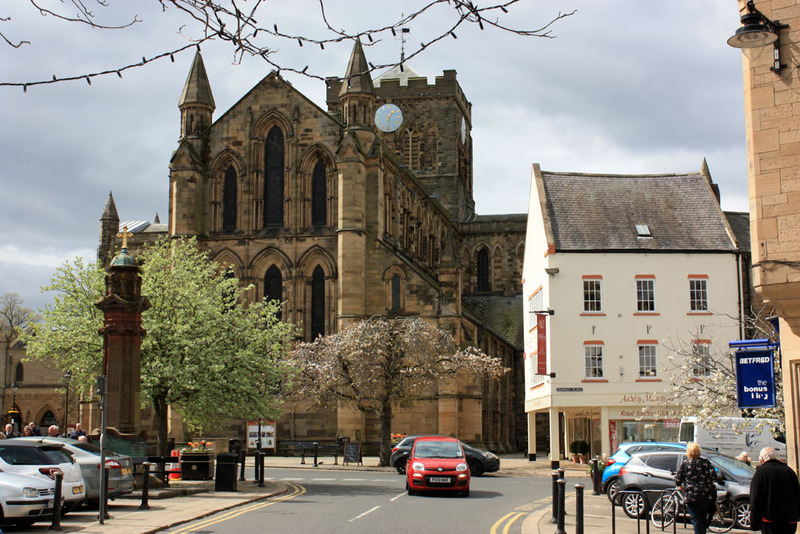 The cathedral and see of Hexham was later superseded by Lindisfarne and Chester-le-Street. By the time of the Norman Conquest Hexham and its abbey were part of the see of Durham but in the reign of Henry I it regained a degree of independence, when the town and its surrounding district known as Hexhamshire’, were confiscated from the Prince Bishops of Durham and given to the Archbishops of York, to whom it belonged until 1837. In 875 A.D, Hexham and its abbey were severely destroyed by the Vikings, under the leadership of Halfdene the Dane but historically Hexham is better known as a long suffering target for Scottish raids. A most notable raid was that of 1296, when the Scots laid the town to waste, burning the abbey and the Hexham grammar school. Another great raid took place in 1346 when King David of Scotland plundered and burned the abbey prior to the Battle of Neville’s Cross, near Durham. Hexham abbey suffered badly at the hands of many Scottish raids, but centuries of continuous rebuilding, have ensured that a complete historic abbey, or more accurately, a priory church, still stand at Hexham today. Sadly of the work of St Wilfrid, only the Saxon crypt remains beneath the abbey floor. There is however one other reminder of St Wilfrid’s time, namely a thirteen hundred year old Anglo-Saxon ‘Frith’ or ‘Frid’ stool, which is found in the abbey choir. Carved from a block of stone, it was at one time used as a symbol of the sanctuary provided for criminals and refugees at Hexham. The ‘stool’ or ‘stol’, is said to have been the throne on which Northumbrian kings were once crowned but is more likely to be a a primitive example of a bishop’s throne. The abbey dominates Hexham’s busy market place, which has witnessed much of the town’s turbulent past. 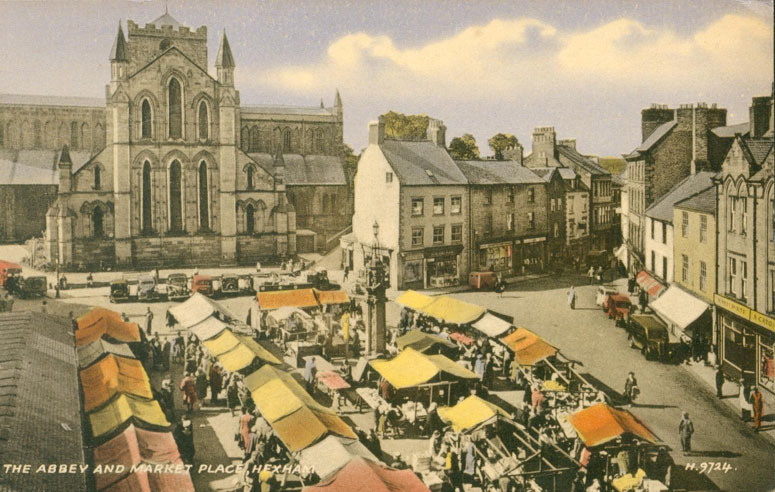 It is however, somewhat surprising to discover that one of the bloodiest events of Hexham’s history took place in this market place as late as the eighteenth century, long after the days of the border warfare. The incident occurred on the 9th March 1761, during a protest against methods of conscription into the local militia. Objection was to the election of men to the militia by balloting, instead of the selection of recruits by landowners, as had previously been the case. The introduction of this new system met fierce resistance in other parts of Northumberland and in Durham so there was a large military presence for the balloting of men at Hexham. The story has a rather sad and gruesome ending – on the 17th August of the same year, a seventy four year old man called Patterson was arrested for his alleged involvement in the Hexham ‘riot’. He was sentenced to be hung, cut down alive, to be disembowelled, have his entrails burnt (in front of his eyes !) and then to be beheaded and quartered. In the event it was decided that the old man’s sentence be reduced to a straight forward hanging. Straight forward it was not, Patterson’s rope snapped before he died and in the tradition of a martyr, he was able to utter his last words ‘innocent blood is hard to spill’. It was later discovered that Patterson had not been in Hexham on the day of the riot !